It’s not much to look at from the outside, but once you’ve tried melt-in-your-mouth royal red shrimp at King Neptune’s, you’ll swear you’ve died and gone to heaven. When you walk into the Gulf Shores eatery, you’ll be greeted with a beer in an ice cold mug before rolling up your sleeves for the best peel-and-eat shrimp in Alabama. The buttery royal reds are served steamed whole, with heads and tails ready to be plucked to reveal the succulent, sweet meat that tastes more like lobster tail than shrimp. 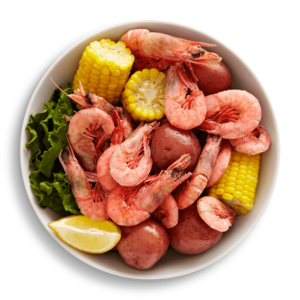 The heap of royal reds are served alongside traditional shrimp boil accompaniments of red potatoes, corn on the cob and garlic toast. The royal reds, available at a reasonable price, are the ultimate shrimp experience. You’ll rave about them to your friends and you’ll eat them every time you return to Gulf Shores.